Most times I like to plan my breakfast ahead. but sometimes its the last thing on my mind so I just opt to go with the flow once I wake up. Usually I hate having the same thing for breakfast every morning because I get really bored. 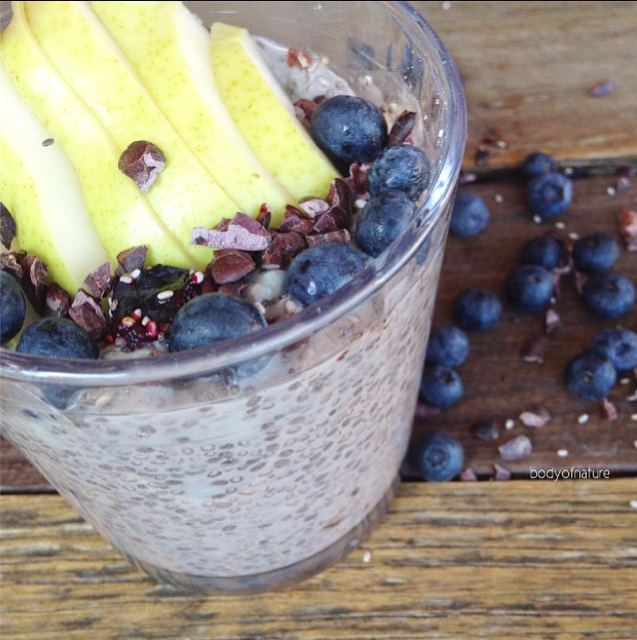 But when it comes to Chia pudding, it’s a different story. I could eat it for days and days and not get bored. I love making and creating different combinations and I love the gel-like texture. It’s definitely one of my favourites! 10g fibre (keeps the.. um.. brown stuff flowing). Chia seeds obtain 9-12 times their weight in water and do the same in the stomach, so if you’re not making them overnight, ensure you soak them for at least 20 minutes to avoid bloating and keep you fuller for longer. If there’s one question I get asked a lot its “How do you make chia pudding?” So, here are my secrets! I stick with the traditional non-diary almond milk + chia seeds base combo because its easy, tasty and requires less energy to digest, however you can replace the almond milk with coconut cream if you want a thick rice pudding. It is important you do get the ratio of chia seeds and liquid right otherwise you will end up with either a runny watery texture or a crunchy grind-your-teeth texture. I aim for a 2:1 ratio : 2 tablespoons chia seeds per 1 cup of liquid and it turns out perfect every time! Tip: The longer you leave the chia to soak, the thicker the chia pudding. It will rise about 1 cm. Combine chia seeds, almond milk and protein and stir. Pour into glass and leave in fridge over night to set.